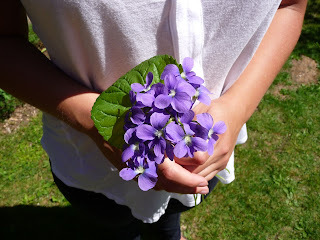 Every spring as a girl I used to candy violets with my dad. Violets are edible, and have a lovely faint floral flavor. 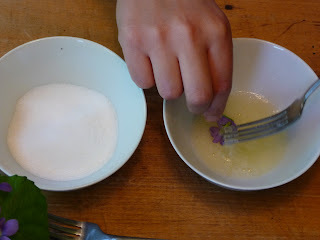 We would pick the best looking ones from the garden, then carefully coat them in egg white and sugar and let them dry. My dad, ever delicate and dexterous, and me, not so much. His always looked like they'd been touched by a fairy's wand, and mine ended up a bit more clumpy. The candying of the violets always coincided with the end of the school year, and to celebrate I would take mini cupcakes to school on the last day, frosted in white, with a candied violet on top. This year I was at my parents' house when the violets were in full bloom. 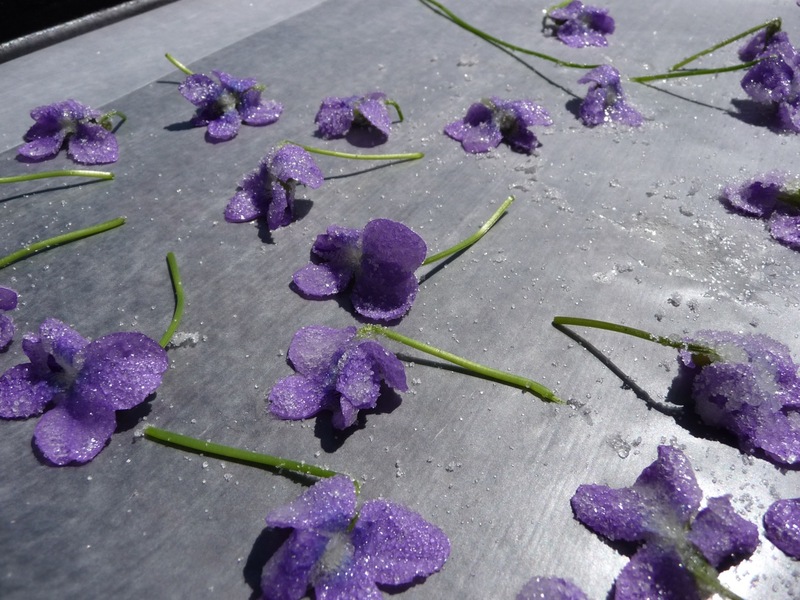 I tried my hand again at carefully coating the violets in a thin layer of egg white, then sprinkling them all over in sugar and leaving them to dry for a few days. They turned out well: I have much better hand-eye coordination now than I did when I was six, though this project made me remember that feeling of anticipation for the end of school and the start of the long summer holidays. 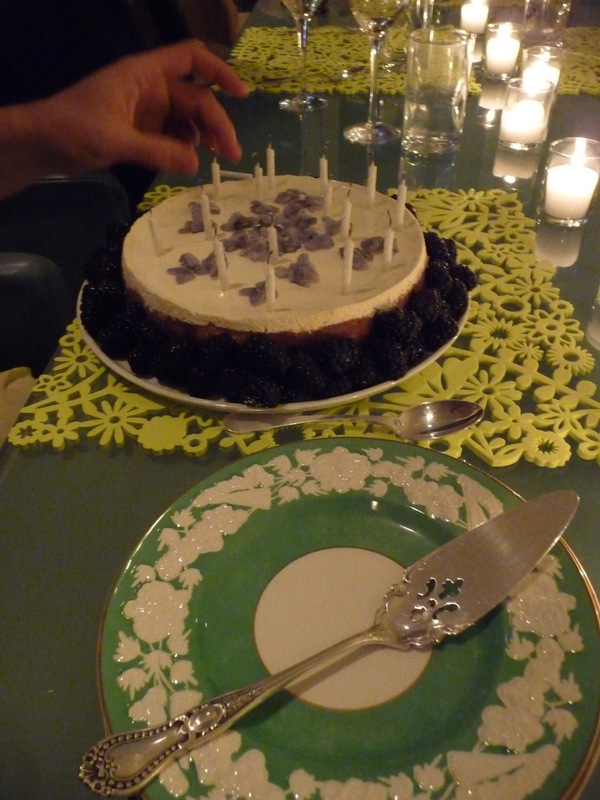 I didn't make mini cupcakes for my classmates this time, but I did make a cheesecake for Liam's birthday and arranged the candied violets on top and blackberries around the edges. 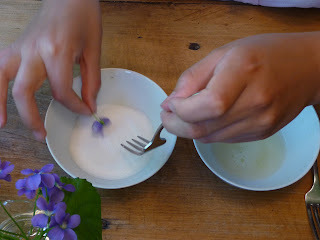 Holding the violet by the stem, very carefully submerge it in the egg white. Using the fork, smooth egg white over every surface (the sugar will only stick to areas moistened by egg white). 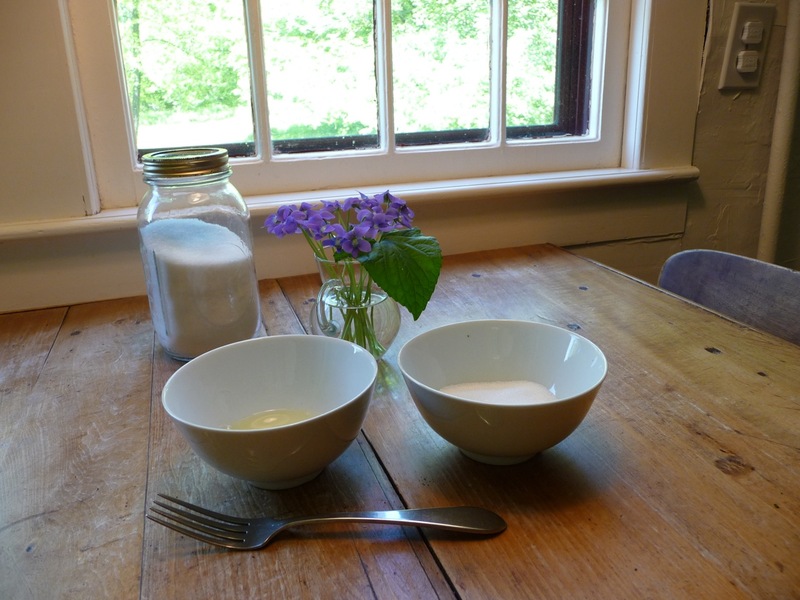 Holding the violet at the side of the bowl to steady it, use the fork to open up the petals and smooth off excess egg white. Using a dry fork, sprinkle sugar over all the surfaces of the flower. 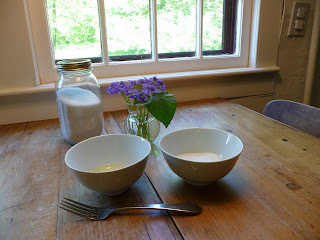 I find using my fingers instead of a fork works best to control the amount of sugar I put on. Don't put too much as it will clump and weigh down the petals. Carefully place, stem side down, on the waxed or parchment paper baking sheet. Allow to dry in a cool, dry place for at least two days. Then carefully peel the violets off the paper and store in an airtight container. They should be used as soon as possible after they have dried because they will begin to lose their beautiful color after about a week.